Scrapbook Ribbons & Scrapbook Fibers have come a long way since first introduced in 2000 from just putting them into the holes at the end of tags. Ribbons & Fibers used in Scrapbooking can vary in size, shape and color. They can be wired, metallic, very narrow or very wide. 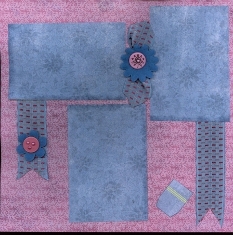 Most Scrapbook Kits you can purchase have a collection of 4 or 5 ribbons in them and I have often heard questions about what do I do with the ribbons! Here are a few examples to show you how they can dress up your pages with various types of Ribbon. 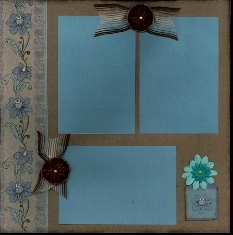 Here is some beautiful wide Blue Ribbon with Pink accents used on these layouts made from supplies sent with the Personal Shopper February 2010 kit. 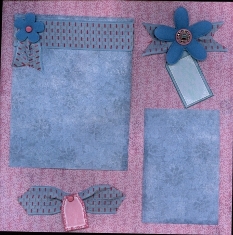 This Blue and Pink ribbon made it really easy to tie in these Blue and Pink papers for this layout. A close up of one of the embellishments for these pages gives you a good look at the design in the ribbon. 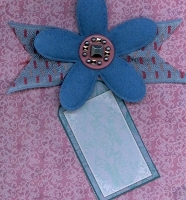 The Blue Felt Flower was from my own stash. 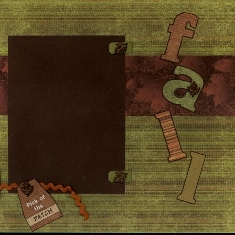 Here is some gorgeous and elegant wide Brown & Tan Striped Ribbon used on these layouts made from supplies sent with the Personal Shopper March 2010 kit from PaperWishes.com. 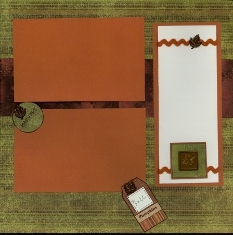 This Brown & Tan Striped Ribbon really ties in with the papers used in these layouts. 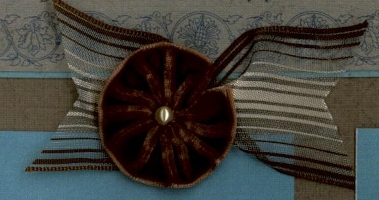 A close up of one of the embellishments for these pages gives you a good look at the design in the ribbon as well as the use of the Brown Velvet used to make the Flower. Flowers like the can be made with a small strip of ribbon that is stitched with a running stitch along one edge and then the stitches are pulled together to form the center and then knotted. 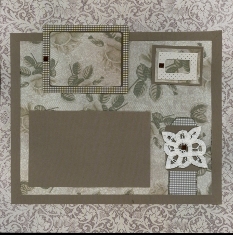 Here are some layouts using Pieces of Lace to add a vintage flair from the Personal Shopper November 2006 kit from PaperWishes.com. While this is not Scrapbook Ribbon, any piece of old or even new Lace can be used to make your Scrapbook Layout "Vintage" or "Classic". 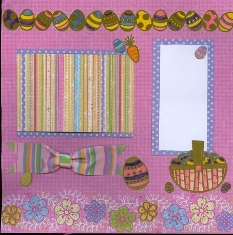 Scrapbook Ribbon Tip: The checked strip is not Scrapbook Ribbon, but is paper cut to look like Ribbon. 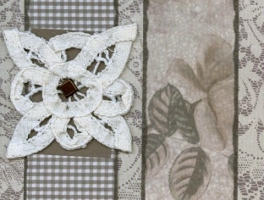 A close up of one of the embellishments for these pages gives you a good look at the use of the Lace. 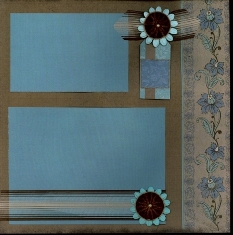 Here are some layouts using Metallic Blue Scrapbook Fibers & Ribbon to add accents to Flowers and Stems from the Personal Shopper March 2009 kit from PaperWishes.com. 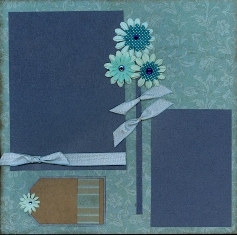 Scrapbook Advice Tip: The Tied on Ribbon Bows replicate leaves on the flower stems. Scrapbook Advice Tip: Another use for narrow ribbon, from 1/4" to about 1/2" is to use it for Iris Folding instead of folded papers. 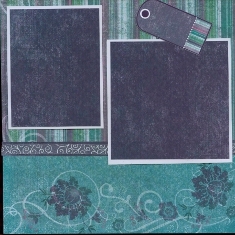 Here are some layouts using Pastel Striped Ribbon as a border accent under a photo matte. The Ribbon actually matches the colors in the matte from the Personal Shopper April 2010 kit from PaperWishes.com. 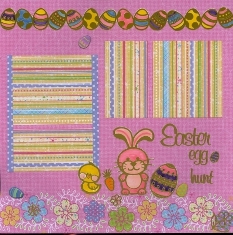 I just love their matching, but matching of papers and embellishments is one of the great things about purchasing Scrapbook Page Kits. Scrapbook Ribbon Tip: The Tied on Ribbon Bow is really one short piece of the ribbon folded in thirds and wrapped around the longer flat piece with the two ends cut at angles. This is a much easier way to make a "Bow" that is not lopsided. 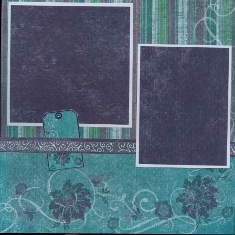 Here are some layouts using Chiffon Swirl Ribbon as a border accent across the page where the design in the paper changes. These layout items all came from the Personal Shopper May 2010 kit from PaperWishes.com. Scrapbook Ribbon Tip: The Chiffon Ribbon is very sheer except for the swirl design, so it makes a great accent when placed on a solid color like this border strip. Here are some layouts using Rick Rack as a border accent. These layout items all came from the Personal Shopper Nov 2006 kit from PaperWishes.com. 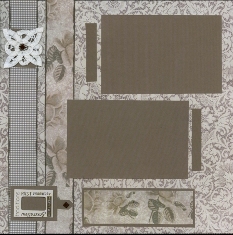 Here are some layouts using Wide Sheer Metallic Ribbon as a border accent. These layout items all came from the Personal Shopper February 2010 kit from PaperWishes.com. 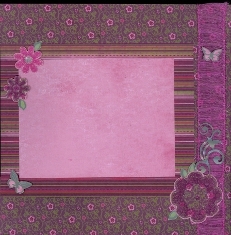 Scrapbook Ribbon Tip: Here the Wide Sheer Metallic Ribbon is used as a Border Accent over a coordinating color of paper. Other floral accents and Dazzles (metallic stickers) are placed over the ribbon. 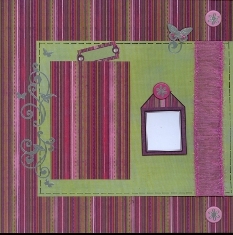 More examples of using Scrapbook Fibers & Ribbons. that can be Made & Found, instead of Purchased.